9182 ft (2799 m) . 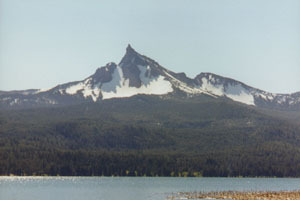 The soaring spire of Mount Thielsen is the highest of several eroded volcanic remnants which mark the central part of the Cascade Range in Oregon. A few hundred-thousand years ago, Thielsen was a broad shield volcano much like its western neighbor across Diamond Lake, Mount Bailey. Several stages of heavy glaciation have stripped away the outer cone, leaving behind only the hard remnants of solidified magma which mark the inner conduits, with broad talus slopes occupying the gaps between the ridges. The summit spire itself requires one pitch of roped class-5 climbing and is unskiable under any conditions. 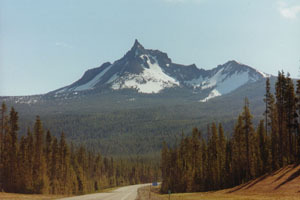 Thielsen also hosts Oregon's most southerly glacier, the tiny Lathrop Glacier, which is located in a small cirque at 8000 ft (2400 m) beneath the craggy cliffs of the north face. However, the steep talus slopes (especially the Southwest Face) provide excellent ski terrain when snow-covered in winter and spring, although they do not retain snow long into summer. Access is simple from the Mount Thielsen trailhead near the resort area at Diamond Lake. 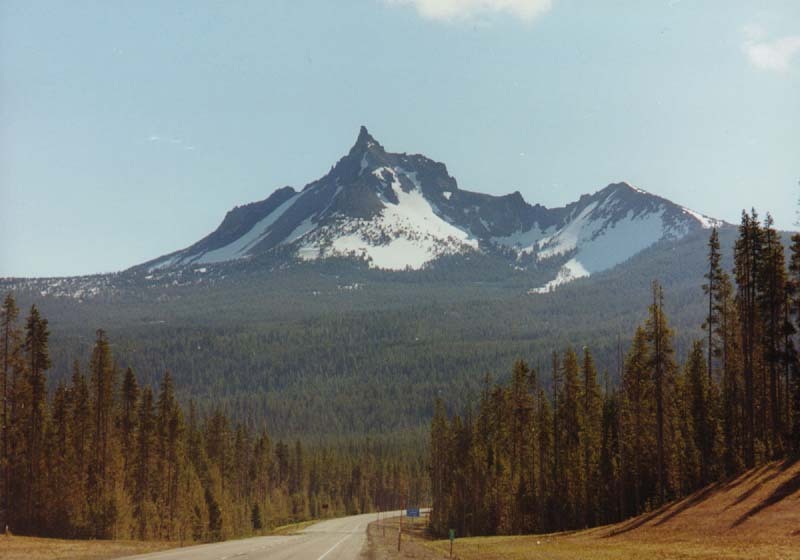 (16 km) The standard (and safest) climbing route to the summit of Thielsen follows the Mount Thielsen Trail to its junction with the PCT near tree line and then heads up the open, steepening slopes of the southwest bowl to the base of the summit pinnacle. The bowl provides a variety of skiable lines, in early season starting from just below the summit pinnacle on slopes approaching 40 degrees. Several of the lines pass through couloirs between spectacular lava pinnacles which mark the upper portions of the bowl. The bowl typically remains skiable into late spring, but the uppermost portions lose their snowcover earliest due to the combined effects of wind and sun. An alternate slope accessible from the same approach is the northwest bowl, which is skiable from a saddle near 8500 ft just north of the summit, and due to its NW aspect may sometimes have better snow conditions. (21 km) Howlock Mountain is a subsidiary peak which lies about 3 miles north of Mount Thielsen along Sawtooth Ridge. This route initially follows the Howlock Trail, but then turns southeast up the Thielsen Creek drainage to reach the meadows at Thielsen Camp on the PCT, beneath the imposing (in fact slightly overhanging) North Face of the summit pinnacle. A variety of slopes are skiable, including the Lathrop Glacier which reaches 8200 ft in a cirque below the North Face, although the upper portions may have severe rockfall hazard.